ST 37 - "I Love to Talk, If There's Anything to Talk About"
ST 37 "I Love to Talk, If There's Anything to Talk About"
This album was released over a year ago and Texas's ST 37 should have another album out by the time this review sees publication, but it's new enough so let's do it anyway. First, being on Emperor Jones, this is the first of their releases to find its way into some larger stores, and accordingly, in terms of production, this is definitely the most polished release of theirs to date. However the rough, indie space-punk sensibility remains to almost the same degree as before, and while not quite as mind-blowing as their "Spaceage" release, contains some of the best tunes/moments of their career thus far. It's apparent the moment the opening track "Acetone" kicks in with its blues-guitar run that there is more of an indiginous Texas twang on this release than before. It proceeds to become a pretty straight-forward rocker, though one which is crafted with such great care so as to become an instant classic, passing through great moments of Carlton Crutcher's laid-back apathetic vocal, the group's patented brand of space-soup (aka "blanga") and culminating in a hysterically fun Spanish-Mexican guitar lick. Following is the monster-improv of the album, "Palpable", moving slowly through 17 minutes of trance-psychedelia, driven by the occasionally-shifting bass-line of Scott Telles, a constantly-recurring sample of a woman's voice pontificating on something-or-other, flanged guitar and grumbling-monster electronics. Perhaps a bit too lengthy, but subtle and multi-layered enough. Next is "Discorporate", not a Zappa cover but a dreamy psychedelic floater whose radio-broadcast even garnered a phone-response from a young lady who said she was listening to my show and gazing out the window when the tune came on to bring her to even greater ecstacy. It also features the sole lead-vocal contribution by Scott Telles, whose distinctive voice may seem to strain a bit during the higher notes, but then that's half the beauty of it anyway. "Tentacle Like Fibers" is a solid mid-paced rocker, with more of Crutcher's low-key cynical vocals, though I get a modern radio-pop vibe whenever the chorus kicks in. 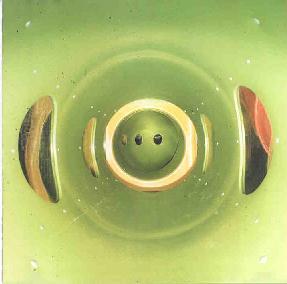 Still, the destroying synth/tape and flying-guitar blanga which characterizes the disc remains in the foreground. "Heaven Tease" is an instrumental psyche-jam which tortures and teases the ears with guitar and fading whoop-whoop-whoop synth. The remainder of the album is quite varied. "Whistling in Hell" is serious brain-slaughter featuring more great stream-of-consciousness twangy vocals of slow terror by Carlton (my personal favorite: "I like to eat them poison berries because they make me paranoid - I like to be paranoid because it keeps me awake"), Helios Creedisized wah-chainsaw guitar, unrelenting drumming by Dave Cameron and some in-the-pocket whistling; devastating. From here, the energy starts to wane a bit, but we'll give 'em that it's a 75-minute disc. "William S. Burroughs Memorial Drum Loops" is a fairly experimental bit, with several drum loops (hate to be redundant), "whang-whang" guitar sounds and waves of noise. Following is a drastically different side of ST 37: a cute little cover of Eno and Cale's "Lay My Love": it's fun. "No Magic Bullets" is another Carl-tune and has some more cool vocals/"lyrics" and Helios/synth terror-blanga. The album closes with the creepy ambience of "Plate Tectonics". Perhaps this would be best listened to at twice instead of once. Or however many segments you're most comfortable with. Solid and big as Texas itself. Or at least Austin anyway.